Several hundred people attended a rally at the State Capitol calling on Gov. Nixon to sign SB 113, which would roll back many of the provisions in Proposition B. A young woman holds a sign lampooning the Humane Society of the U.S., which opposes any changes to Proposition B. Around a hundred Proposition B supporters rally in front of the Mo. Governor's Mansion, calling on Gov. Nixon to veto Senate Bill 113. Demonstrators hold signs while calling on Gov. Nixon to veto Senate Bill 113, which would roll back many of Proposition B's regulations. Rebeccah and Greg McNay of Kansas City brought their dogs, Bonnie and Clyde, to the pro-Proposition B rally outside the Governor's Mansion. Proposition B opponents say the regulations will put good breeders out of business while bad ones will just ignore the law. Meanwhile, the governor is still touting a compromise that would remove the 50-dog limit but leave many of Prop B’s regulations in place, while giving breeders more time to implement the new standards. State Senator Brian Munzlinger (R, Williamstown) says the stricter bill must be signed first before the compromise language can be added. “That’s been done before and that’s the way it works," Munzlinger said. Meanwhile at the Governor’s Mansion, about a hundred Proposition B supporters called on Nixon to veto the rollback. Barbara Schmitz is with the Humane Society of the United States. 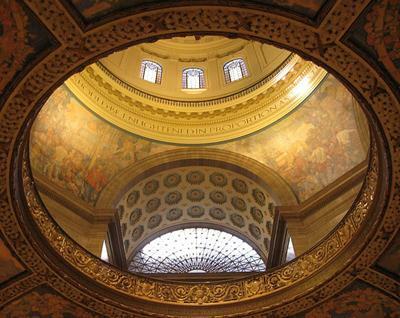 Schmitz also opposes the compromise proposed by Governor Nixon. He has given no indication so far if he'll sign or veto the Proposition B rollback. Update: A 2 p.m. scheduled press conference with Gov. Nixon on this topic was canceled without explanation to the press. Missouri Gov. Jay Nixon says officials are making progress toward completing an agreement on a dog-breeding law to make revisions embraced by the governor. The Legislature earlier passed legislation to rewrite a dog-breeding law that voters approved last year. Nixon didn't say Wednesday if he'll sign or veto that legislation. A compromise has been announced between supporters and opponents of Proposition B on a new proposal to overhaul dog-breeding regulations passed by Missouri voters last year. 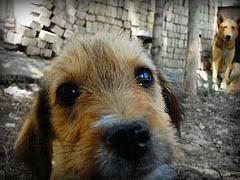 The agreement would remove the 50-dog limit, allowing breeders to have as many dogs as they want. Missouri lawmakers have given final approval to legislation replacing many provisions in a dog-breeding law approved by voters in November. The House approved the legislation 85-71 on Wednesday. It cleared the Senate last month and goes now to Gov. 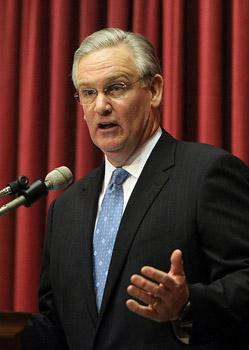 Jay Nixon. The bill eliminates a cap on owning 50 breeding dogs and rolls back various new requirements on dogs' living conditions. Instead, breeders would need to provide appropriate space for their animals based on regulations set by the Department of Agriculture.